are you looking for year original way to promote your business? Then thesis wooden Yo-Yo’s might be perfect for you! Wooden Yo-Yo’s are the perfect gift for young and old. Can you imagine the hilarious reaction of a mature person when they receive a Yo-Yo? You can easily hand out these Yo-Yo’s at events and markets, and you can count on many visitors if you hand out these awesome gifts with your logo and company name on them. The people who get a Yo-Yo will most likely immediately start playing with them, and the people who see the it will want one as well and will visit your stand. Here at euro-logo we only sell very high-quality wooden Yo-Yo’s. this way, you’ll give people a quality gift that they won’t just throw away. 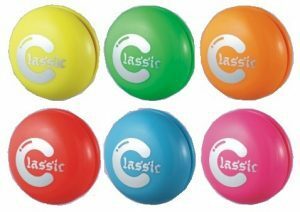 We can print you logo and company name on the Yo-Yo’s, so that everyone who has one of these, will automatically advertise your company. Our Yo-Yo’s are good quality and available in multiple colors, like yellow, red, green, blue, white and a standard wood texture. Because of the good quality the Yo-Yo will last a long time, so that you’ll be able to enjoy the advertisement for a long time. is your audience mostly children? Then these awesome gifts will surely get your company a lot of attention. Kids will absolutely love these! They will take them everywhere and show them to everyone, and of course this means they’ll see your company name and logo. These Yo-Yo’s are a good investment that will surely get you many positive reactions. They’re available in many colors, ask us if your color is available too. You can order our Yo-Yo’s starting with 250 pieces. But the more you buy, the cheaper they get.